Here's a fun way to encourage your new braces wearer or to celebrate that day when they finally come off! The braces male personalized Christmas ornament is handmade and lettered by hand with your personal message. These kids ornaments personalized to make them enjoyable keepsakes in later years come with a display cord for hanging and our special velvet gift and storage bag. 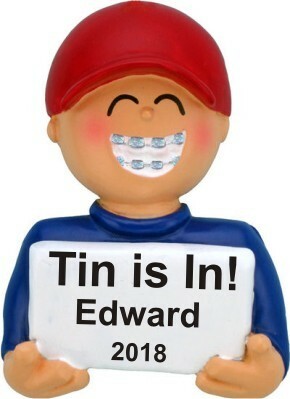 Let him know his smile will be fantastic with the cute and colorful braces for boy personalized Christmas ornament.